A common theme in books, movies, television, and childhood development discussions is the subject of determining what the child will be when they grow up. Some parents know what they want their child to become and attempt to steer (gently or not) their children towards that career path. While others try very hard to leave that choice up to their children. I think I'm somewhere in the middle. I'd like my son to grow up to be a good provider and father while doing something he enjoys. Meanwhile, I have hopes that my daughter will grow up and fill the traditional role of wife and mother. Most importantly, though, I want them to have a complete and excellent education so that all possibilities are open to them for their choosing. One way I open these doors of career choice is to expose them to both traditional and nontraditional careers. Every kid knows that they can grow up to be a doctor, fireman, police office, teacher, or veterinarian but do they also know that they can also be a guy who makes funny noises for a living, a flying trapeze artist, an advertising expert, or an animal trainer for the movies? There are so many choices out there that the average person doesn't stop to consider. It is these choices that I want to my children to know about. Often, it is these nontraditional careers that people create for themselves, that bring the most satisfaction in life. Try talking to a secretary or grocery store clerk and ask them if they find their jobs satisfying. Then trying asking the noise guy or the reptile man if they enjoy their work. These latter folk seem to be much more satisfied with their work, and their lives because of it. I want my children to find that kind of satisfaction, thus I expose them to the idea that they can do anything that they can think up if they wanted it bad enough. With that in mind, I'm taking my kids on some rabbit trails that launched from our circus field trip earlier this month. We are reading an interesting book called Circus Dreams: The Making of a Circus Artist. It follows a young woman by the name of Montana Miller as she postpones college to attend a professional circus training school in France. She was the first American to attend the school back in 1988. Her dreams were to become a flying trapeze artists. It has been very interesting. It takes a lot of work to be in the circus! Another spin-off from the circus trip has come in the form of the kids' pretend play. They have decided to put on their own circus and set out to complete a flyer to go with it. 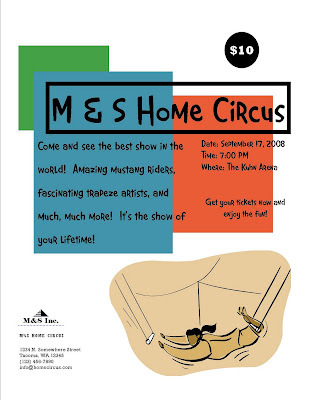 I jumped in to help Mika create a color flyer for their circus performance. As we explored Microsoft Publisher together and created her flyer, I explained that some people do this for a living. Below is the flyer Mika created...with a false address, phone, and email of course. The neat thing for me...Mika was so excited when it printed out, in color, and looked so good. Reserve a spot for me!